***** In the 100th anniversary year of the end of World War World it feels right to be in the audience for at least one play about the British military, and SUTCo have fulfilled this need with this new play written and directed by their company member Conal Gallagher. 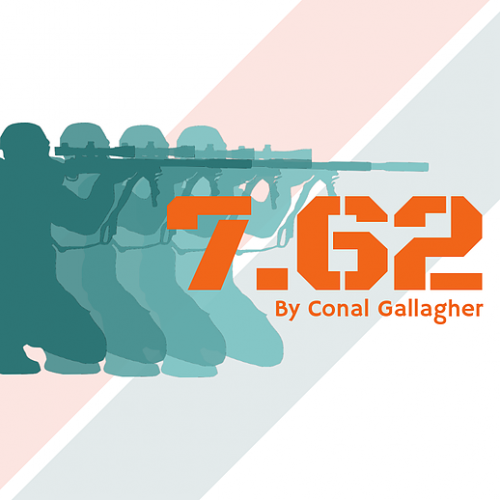 7.62 tells the story of four members of the armed forces, Alex (John Ireland) and T (India Willes) experienced, veteran snipers with years of experience between the two of them, and Charlie (Harriet Anderson) and Jay (Ed Lee) who arrived the previous week. As snipers in the military they can wait up to 17 hours in the same location before engaging a target, the time passes slowly, and the mind-numbing boredom is relieved in many different ways. As they slowly begin to grow together as friends and mentors, the lines between what they’ve seen throughout their lives and what they see through the rifle’s sights begin to become blurred; with disastrous consequences for them all. 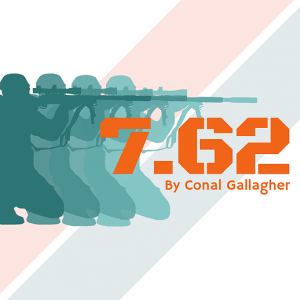 7.62 is an intense hour of theatre that will make you think about and give you a genuine insight into the day to day life of snipers, made all the more real by the audio snippets between scenes of the real life experiences of snipers. It is definitely worth heading out in this week’s miserable November weather to see and is guaranteed to change how you think about snipers and are armed forces abroad. As audience members, within minutes we forgot we were watching actors on a small stage and instead through the detailed set (designed by Meriel East), army uniforms (thanks to Rebecca Sze), realistic lighting (Morgan McArthur and Esme Constanti), the incredible and natural acting ability of all of the cast and the writing and direction of Conal Gallagher, found ourselves transported to the frontline. Conal’s script is superb, perfectly creating and capturing the very human characters, their thoughts and mindset, speech and language, and emotion and coping strategies. The high quality writing provides an incredible insight into snipers that you would only expect from someone much older and with consider knowledge and personal experience of the armed forces. All four of the main cast members were excellent, bringing their characters completely to life and superbly capturing and sharing their war torn experience, the enthusiasm of the youth, the emotion of grief and how to deal with it, and offering a reminder of why it’s important to go through life “one day as a time”. The natural chemistry between all of the cast shone through in their support, humour and bond on stage and meant that their characters development throughout the play felt even more genuine. Whilst the play left me with an urge to read Stephen King’s Black Tower series, and slightly less of an urge to listen to more Spice Girls songs, its intense and emotional climax reminded myself and the rest of the audience and the characters how quickly one minor action can change lives forever and provided a further reminder of the realities of war zones and the implications of everything we do. On a more important level, the play acted as a reminder, not that one was needed, of the wonderful new writers and actors coming through SUTCo and why we need to go out of our way to see their work. 7.62 will be performed at DINA at 7.30pm until Saturday 1 December. Tickets are £6 in advance and £7 on the door. To book visit www.sutco.org/tickets. The award winning SUTCo perform four shows a semester. For further information and to book visit www.sutco.org.